2. O’Sullivan PB, Twomey LT, Allison GT. Evaluation of specific stabilizing exercise in the treatment of chronic low back pain with radiologic diagnosis of spondylolysis or spondylolisthesis. Spine 1997; 22(24): 2959-2967. 3. Ljunggren AE, Weber H, Kogstad O, Thom E, Kirkesola G. Effects of exercise on sick leave due to low back pain: a randomized, comparative, long-term study. Spine 1997; 22(14): 1610-1617. 5. Hertling D, Kessler RM. Management of Common Musculoskeletal Disorders – physical therapy principles and methods (3rd ed.). Lippincott, Philadephia, 1996. 6. Cairns MC, Foster NE, Wright C. A pragmatic randomized controlled trial of specific spinal stabilization exercises and conventional physiotherapy in the management of recurrent lumbar spine pain and dysfunction. IFOMT 2000; 91-95. 7. Richardson C, Jull G, Toppenberg R, Comerford M. Techniques for active lumbar stabilization for spinal protection: A pilot study. Australia Journal of Physiotherapy 1992; 38(2): 105-112. 8. Richardson C, Jull G, Hodges P, Hides J. 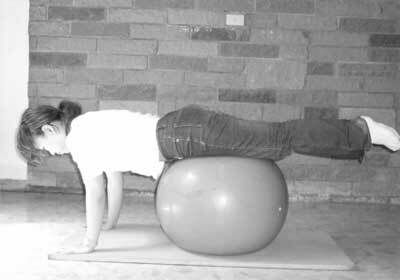 Therapeutic exercise for spinal segmental stabilization in low back pain- scientific basis and clinical approach. Churchill Livingstone, Edinburgh. 1999. 9. Panjabi M M. The stabilizing system of the spine. Part I. Function, dysfunction, adaption, and enhancement. Journal of Spinal Disorders 1992; 5:383-389. 10. Hodges PW, Richardson CA. 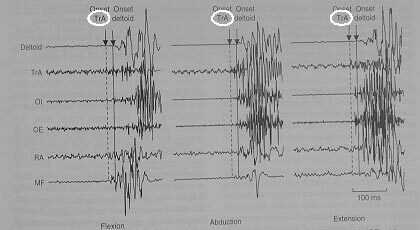 Feedforward contraction of transverses abdominis is not influenced by the direction of arm movement. Experimental Brain Research 1997; 114: 362-370. 12. Hodges PW, Richardson CA. 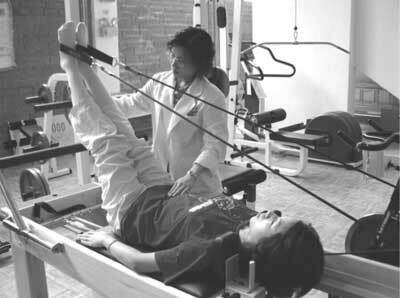 Inefficient muscular stabilization of the lumbar spine associated with low back pain- a motor control evaluation of transverses abdominis. Spine 1996; 21(22): 2640-2650.